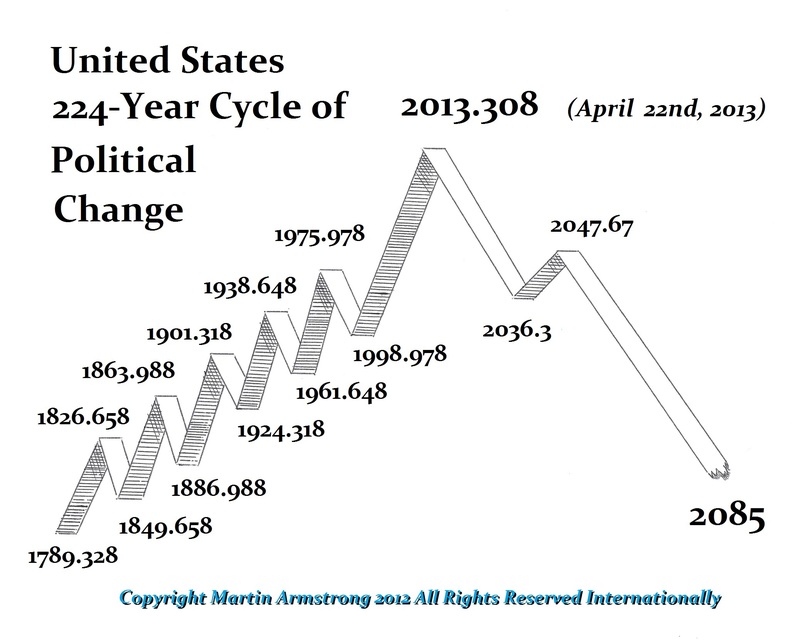 I read your essay on the 224 year cycle and the peak in the United States would occur April 22, 2013. That was the start of Obama’s Syrian invasion argument. I must say, I am blown away with the accuracy of your work. I read an article in the newspaper here that highlighted this event as the decline of America as a world power. Can you explain how or why your models are so refined? From that target all you read about now outside the United States is how America is collapsing as a world power on every front from China, Europe, and Russia. Thank you for opening my mind. ANSWER: I have written many times before that this has been my privilege to discover the incredible order hidden behind the mask of randomness and chaos. I did not begin this pursuit as some theory to prove. It has been my discovery and in that vain, I hope to leave behind a new field worth exploring. So I have no explanation as why such turns can be pinpointed to the day or what makes these things unfold with stunning accuracy. It has been my blessing and my curse. The blessing is that people like you observe and are moved by fascination. The curse comes from those who do not believe and assume I somehow manipulate the world instead. They will do whatever they can to slander me and to try desperately to prevent others from even reading a single word I might write. The article you have linked that “the end of America as a World Power” from the German press attributes the start of the decline and fall of the United States to this Syrian issue. This was the first War Obama could not sell. The American people were lied to way too many times to start wars. There was no support domestically and the standard lies failed. It marked a change in trend for government and ever since, Obama has failed on every possible front. He told the allies not to join the Chinese effort to undermine the World Bank and IMF – they did. One by one, former allies are turning their back on Obama even on the Russian sanctions. The NSA has been caught and American technology is on the decline with products being banned in China. From this turn in the model, it is like a Financial Panic. Everything is collapsing so rapidly it is mind-blowing. 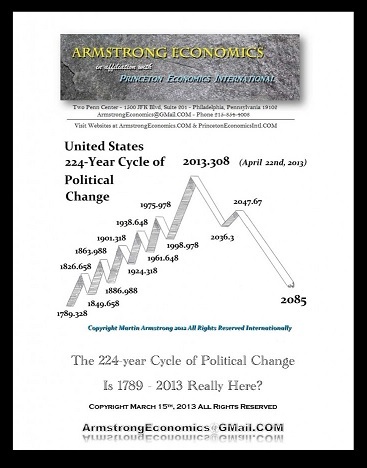 People are now starting to see that report, 224 Year Cycle of Political Change, as a classic. But as I have said, this was my privilege to discover, not my theory to prove. Trying to figure out why everything functions so precisely is a journey others will continue long after I am gone. Anyone’s work in such a new field is often hated and ridiculed while they are alive and at times plagiarized for others despise someone who gains attention they wish they had. Only after such a person passes does the work continue without the personal attacks, jealousy, and hatred. That is just the dark side of human nature. My work has always been more accepted in Asia and Europe and hated from the epic center of New York. There are those who are curious to learn, and others who are on ego trips and hate others who have something they wish they had. The former constitute the group of knowledge seekers whereas the latter is that dark corner from which communism and socialism emerge – the quest to covet whatever their neighbor has. Some call this the battle between light and darkness or good and evil. But it exists. The latter will always try to discourage people from reading for they cannot stand anyone having something they do not.